This question puzzles us every time when we go for select the right one career in engineering field. If you have interest in design, construction and creativity of natural or physical build environment, then civil engineering is the best disciplines for you to prove your ability and find the career which you wish to. 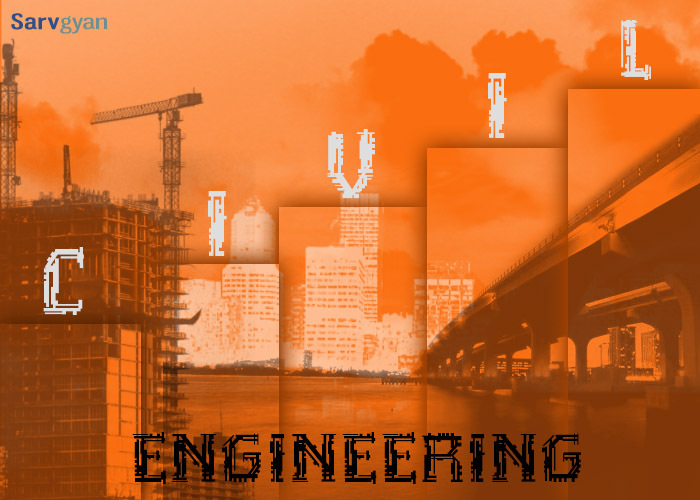 Civil engineering is second oldest professional degree in the field of engineering. In past, it was known as the “Military Engineering”. Some of the large and world-wide popular monuments like Taj Mahal, Eifel Tower, Dubai Resort, great wall of China etc are the best example to prove that how important and valuable branch is this? In the year 1828, civil engineering declared as the professional programme in London. No doubt that the Civil Engineering is the best art to bring us towards development. From roads constructions, building constructions, port constructions to river and township planning & construction, all are the workplace for this engineering branch. Get Latest Career Notification about Civil Engineering, by entering your details below. You can choose the Civil engineering, once you have completed your secondary or Sr. secondary examination. For entering in Civil Engineering, either in diploma or UG, mathematics and physics are the compulsory and has to be in qualifying examination. For entering in PG (M.Tech) programme, B.Tech in civil engineering is must. So now, you have a complete package of education in Civil Engineering after 10th upto research programme. Civil engineering is a deep field of technical education. It has divided in various specializations after completed the B.Tech degree. For make the masters in specified field by the growing global demand and extending work area, it has the following specialized academic programmes leading to the M.Tech degree. So many institutions are offering the Distance Education or Online Education in Civil Engineering in India and Abroad. In most countries, you will have to be certified by the professional body after completion your degree in civil engineering. For this certification process, you will have to comply a range of conditions including mandatory exam and work experience before being certified. Then you will be designated as the Professional Engineer (USA, Canada & SA), a Chartered Engineer (Commonwealth Countries), and European Engineers (European Countries). To get admission in civil engineering courses, you are needed to qualify the JEE Main 2019 (national level exam). Candidates can also apply for JEE Advanced 2019 & GATE 2019 examination for admission to the B.Tech & M.Tech courses respectively. Other state and university level exams are also organized for providing admissions such as BITSAT 2019, IPU CET 2019, BVP CET 2019. “Lots of job opportunities are available for the Civil Engineers in both sectors”. By the modern civilization and facilitation of current period, there are rich opportunities for civil engineers in entire world. Every country is in the race of development. A civil engineer can play a vital role for doing so. Yes, you can be a part of this development. You had chosen this field for today and now the time to prove yourself. You need to have enthusiasm and ability. Trigger yourself and find the right career. You can be a part of building developers, town developer, canal works, city planners, road & rail transport developer, dam & bridge developer and any workplace wherein the building/construction/physical creativity or natural resourcing creativity is involved. After the completion of degree in civil engineering you can go for the public/private sector or government sector as well. In abroad the salary started from the $60000/annum to $100000/annum. There is no criterion of salary for the brilliant or experienced candidate. During the course of civil engineering, you will get to know about the design, hydraulics, construction, earth mechanism, soil mechanism, construction management, computer methods, structural machine, environmental nature & issues and traffic & transport. Most of time, students are puzzled when they are being asked about the right book by the right author (accordance to their study). For any other queries related to Civil Engineering, you may leave your queries below in the comment box. I’m in 7th sem of B.E. And very less cpi I have.. 6/10 only. I can’t understand what should I do after B.E..
M.E. In India/foreign or something different..
Job/B-tech is best after polytechnic. Sir,How we join any American University for b-tech after polytechnic. After BE in civil, what should i do? Job or m.tech? you can go for Job, or you can also pursue M.Tech, both options are good. Are the positions and salary for m.tech and BE same for a job? No, the salary and job positions generally vary, salary and job profile will be a bit higher for a M.tech graduate. So it seems better to join m.tech but is there any entrance exam other than Gate to apply where scholarship will be given just like Gate scholars? GATE is the only one exam approved by the govt of India, by which you can pursue M.Tech courses and also eligible for scholarships. Sir I am still have in BE civil.I want to government job what I should be do.?? sir i am a third year degree student, i want a government job,so what should i do…..? It is very goood information about civil engineering.Now I am joining the B.tch and I have completed 12 standard. I have completed btech in civil engineering this year.i am really confused about whats next? I have read about masters in industrial design.does anyone know about civil engimeering scopes after masters in industrial design? sir i have completed my B.E. civil…suggest me some courses and can i do architecture after civil engineering? Sir I have recently completed my BE civil now I wanted to be in field of architecture. sir can you suggest any courses after BE civil related to architecture. Or any other courses which I should do after BE CIVIL. I m also studying civil engineering second year (UG). But I want to go dubai or America for studing ME(PG). So how can I go? refer to the university in which you wish to appear. What to do after BE CIVIL i am not interested in GATE , which reputed colleges in india offer admission in M tech. Help choose a course in m.tech after b.tech in CE?I like designing of structures and find analysis interesting.also i would like to take up some research work. Designing of structures is best after B.Tech in CE. sir, what is the scope of mba after civil engineering..? What can I study after B.E. civil?? Thank u sir…. For giving me. Full of knowledge .. I want to become a civil engineer … Yet i’am in 10th class..!! yes civil is a good branch, but you have to pursue further studies like M.E to get a job in abroad. Sir, i have passed B.Tech civil engineering from a private engineering college in west bengal.I didnt get a job from campuss.Now a days there are lack of companies,hires freshers. what should i do now? Should i go for higher studies or any other! please reply. yes you can either prepare for GATE exam, or you can prepare for government job exams. Thank u for ur information…its nice n gud one. I AM VERY HAPPY BY READING THIS FABULOUS INFORMATION . I WAS REALLY CONFUSED AND DOESN’T NO WHAT TO TAKE, THIS HELPED ME ALOT TO CHOOSE THE COURSE………. Sir am currently in class 12 (isc board)…..going to appear in JEE 2016 (both wb and all India)..TO persue a career in civil engineeringcan you please guide me to appear in which competitive exams after JEE. sir i want to know about the lateral entry for btec after diploma in civil engineering. and how many colleges are giving lateral entry in civil engineering in delhi ncr. I am very confuse what I read can u help me????? Thanks for such information. This will surely help me in my future. Sir at present I m pursuing b.tech in second year from Ignou university in distance can you please guide me what I have to do after b.tech? Either MBA OR M.TECH? For higher salary package which degree will help me? What are the subjects to be stutied in b.tech civil? after completing btech 4th year there confirm job opportunities are not.to get jobs with how much percentage. i have done diploma in civil engg this year with 74%..but i have no expirience. and i have also money problm so suggest me that wht i do ? Best colleges in gujarat for civil engineearing ? Sir, I completed my civil. engg. I want to go foreign country what should i do without giving GRE and TOFFLE just i want to go foreign contry how i go for civil engg. For studying in the approved foreign universities, you have to pass GRE or toefl exam. No, you can’t pursue M.Tech in civil, you can pursue various other streams that are related to Electronics. sir i have finished +2 with 82% marks and my PCM marks is 77%.. I would like to opt civil engineering..
but i am little confused if i could win in all of the subjects in civil..
is it much important ? sir now i’m in giving a 12th hsc exam which filled can i take? Sir, I am currently studying 3rd year of civil engineering ,B-tech with average 8.64 .I have a good skills in drawing & designing .After completion of my B-tech degree what way is suitable for me if I wanna continue my study.Please reply……. yes you can continue your studies and pursue M.tech and get a specialization. If you are looking for a course in designing, M.Des. programme is a suitable higher study option. besides this you can avail the Structural Engineering as a specialization in M.Tech. please tell me more about M.Des programme after civil engineering & the career after M.Des …..
which one is more valuable M.Tech or, M.Des…..
both are good option and have good job opportunities ahead, but if you are interested more in design than you may choose M.Des option, otherwise M.tech is also good. Architecture is best as compare to the civil. yes, of course..you can pursue M.tech after your B.tech in civil. I completed my m.tech structural engineering, year of passing is 2014 Dec, now i would like to do the p.hD program in andhara university at visakhapatnam ( A.P ) . Please give the better suggestion to me what is the most job oriented p.hD program. You can choose any courses that your comfortable with, you can select topic as per your interest. you may apply either through your state level entrance exam (if exists) or through the national level as JEE Main. no problem with bio but you should also have the physics, chemistry and math. Sir after civil btech i can apply for MS civil engineering in pakistan? I’m not really that good at drawing. Could I do well in this course? You have to do engineering drwing work, and also require good skills in mensuration.If you are interested in this you can pursue this course and work hard to improve your drawing skills. go for M.Tech or or MBA in operation. well maths will be used in civil engg, throughout the course, also with practice and clearing your basic concepts you can do it. Thanks a lot for this great inform.Now I will study CE yet I am in 12….. Thank You So Much for great information. I am graduate student. Recently working in construction company. I wish to do civil engineering. But, I have no time for attend the college or lectures. That’s why I am looking distance education. Sir can u tell me about how to take admission in b.tech after done my deploma in civil engg..
You can take admission as a lateral entry, which is directly into the 2nd year b.tech.